According to a report from ComScore, U.S. consumers spent more than $100 billion on online travel bookings last year, making 2012 the first year ever that the $100 billion figure was surpassed. 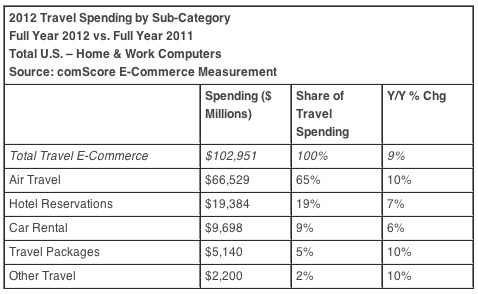 U.S. travel e-commerce sales reached $103 billion in 2012, up 9 percent from the previous year. This is a big deal, right? After 15 years after the shift of the travel industry from the agency driven model to onilne, the industry is still growing at nearly double digit rates year over year. But even though we were pioneers of online sales, we still have a long way to go in making online the channel of choice. The fact of the matter is that there are nearly 2 billion trips taken each year in the US and in 2011 travel spending in the US topped $813 billion. So while $100 billion in online revenues is impressive for any industry, it is far from being the dominant method of purchasing. Nearly two-thirds of all online travel spending was for air travel, up 10 percent from the previous year. From this, one would think that air travelers represent the bulk of the opportunity online. Guess again. Air travel represents just 15% of all travel in this country. Out of 100 people that take a trip, just 15 of them fly. The remaining 85% drive (either their own cars or a rental vehicle). To make progress online, we must shift our focus away from the air-centric view that we have today. So imagine what tapping into the 85% that drive would yield if the online travel community would learn how to harness these travelers. For more information on this opportunity, download Dare to Differentiate, a complementary white paper on the drive market or join Project 85 to stay abreast of the developments on the drive market front. According to ComScore, as for the leading air travel providers, Southwest Airlines had the most page views, with 20 percent market share. It was followed by Delta and United Airlines. Expedia ranked as the top site in the online travel agents category with 32 percent share, followed by Priceline at 17 percent and Orbitz at 13 percent.